Below we discuss evolution of the trail and FKTs. Speed record attempts started on the SHT in about 2005, when the trail was incomplete (about 205 miles at the time). As the trail continued to expand FKTs were set on whatever existed at the time. These trips are documented below. 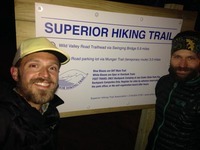 The Superior Trail was completed in 2015(? ), and is now "300+" miles long, running from near Duluth to the border with Canada. This article details how the SHT came to be. Though long trails such as the SHT are often subject to reroutes & changes, we consider trips starting in 2016 to be on the more or less "complete" SHT. Alicia Hudelson set the female FKT for the SHT at 4d17h26m (supported), starting at the northern terminus at 5:11 a.m. on May 23, 2009, and finishing at 10:37 p.m. on May 27. Her complete report is on our old website. Hudelson had relatively little ultra experience prior to this trip, having done the Grand Canyon rim-to-rim-to-rim (47 miles), the 55-mile Courmayuer-Champex-Chamonix race, and 70 miles of the Grand Union Canal race. 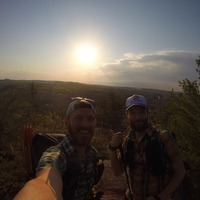 Tim Lupfer and I (Jared VanderHook) completed our self-supported through-hike last night with a total time of 8 days 14 hours 44 minutes setting a new FKT for the 296 mile distance. We used the 7th Edition Guide to the Superior Hiking Trail to plan the trip. We began at the Northernmost point of the trail, the "270 Overlook" and finished at the Jay Cooke State Park Visitor Center. We had 7 resupply points along the way. 4 resupply caches on the trail using bear bins or hanging dry bags (Grand Marais, Schroeder, Lake County 301 and Martin Road). 2 Post Offices (Finland and Silver Bay). 1 business held our box for us, Eagle Ridge Resort at Lutsen Mountain. In addition to miles covered on the main trail we hiked into several towns for meals and/or to purchase supplies as needed (Grand Marais, Lutsen, Schroeder, Finland, and Silver Bay). In Silver Bay we hitch-hiked part of the way back to the trailhead. In Lutsen we hitch-hiked to/from the Cascade Restaurant. In all cases we rejoined the trail at the same point we left it. May 23: 42.5 miles. Started at 6:44am. Finished at Kimball Creek Campsite at 10:30pm. May 24: 26.25 miles. Started at 6:20am. Finished at Cut Log Camp at 7:30pm. Resupply on trail via hanging dry bag (+3.2 mile round trip into Grand Marais for meal). May 25: 33.2 miles. Started at 6:30am. Finished at Carlton Peak at 9:15pm. Resupply box held at Eagle Ridge Resort (+1.8 mile round trip into Lutsen Mountain Resort area). May 26: 27.7 miles. Started at 6:16am. Finished at Crosby Manitou trailhead at 9:05pm. Resupply on spur trail via hanging dry bag (+4 mile round trip into Schroeder for meal). May 27: 30.8 miles. Started at 5:48am. Finished at Palisade East Camp at 10:45pm. Resupply at Finland Post Office and meal (+3.2 mile round trip into Finland). May 28: 38.25 miles. Started at 6:10am. *Finished at Gooseberry Falls camp at 11:48pm. Resupply at Silver Bay Post Office and meal (+3.2 mile round trip into Silver Bay). May 29: 39.5 miles. Started at 6:08am. Finished at Fox Farm Road Trailhead at 11:13pm. Resupply on trail via stashed bear bins near Lake County 301 trailhead. May 30: 34.2 miles. Started at 6:16am. Finished at Duluth Lakewalk at 8:20pm (stayed at Fitger's Hotel). Resupply on trail via stashed bear bins near Martin Road trailhead. May 31: 34.1 miles. Started at 7:40am. Finished at Jay Cooke State Park Visitor Center at 9:28pm. I am planning a self supported attempt on the current FKT sometime in the middle of September . I am still working out the kinks with gps and etc and am planning on using phone's GPS along with pictures and video of days and etc to keep track of time. I plan to attempt the unsupported FKT of the Superior Hiking Trail on Wednesday September 5th. I will be using my Garmin Forerunner 935 for GPS tracking as well as video along the way. Good luck! You heading northbound or southbound? Awesome! If you are going southbound you are going to be in the middle of the Superior 100 Mile Race finishing at Lutsen at 10 PM on Saturday. I will be starting a Southbound, Unsupported FKT Attempt on Saturday September 8th. Tracking with Garmin Inreach Mini. Hi. Bob Timmons from the Minneapolis Star Tribune here. Let me know the outcome of your FKT attempt. Thanks. Jake, you were looking strong! What happened? I will carry everything except water from start to finish. I will not accept any trail magic, support, or outside assistance. I will not be picking up caches or supplies at any point. I will be on foot the entire time and accept no muleing/pacing etc. Depending on available service at elevation, I may be occasionally posting on Instagram if you want to follow along (@miyagi_on_the_trail). you sir are a beast! Thanks everyone for your support and encouragement. I will be attempting a nobo, supported FKT of the SHT on May 23, 2019.